So it’s been a month since I started writing this post. But we’re almost finished! 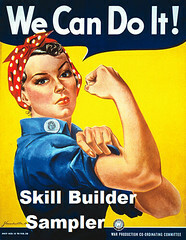 Unfortunately, my pictures for the top assembly have disappeared, so we’re trying this with text only. I’m so sorry! The large blocks and large plain squares are complete as they are, but the small blocks, small plain squares, and plain rectangles need to be combined with sashing to create units that are the same size as the large blocks. You can easily chain piece these units onto the sashing, just as you did during block construction. Sashing is cut the same width as the strips you used to construct your LARGER block. If you are making the small quilt, that means you cut the sashing strips at 1″. If you are making the large quilt, you cut the sashing strips at 1 1/2″. Normally when I piece a block, I join the pieces to form rows, then join the rows to form blocks. Because some of these units contain vertical rectangles, we’ll do the opposite – join the blocks with sashing to form columns, then join the columns to form blocks. This is your quilt. Feel free to switch units around in a different layout if you like. If you are following the exact layout, refer to your coloring sheet for specific placement. 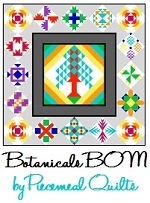 Go through the coloring sheet and chain piece the top piece in a small block or square vertical pair onto the sashing. Press to the sashing as you did with the blocks, then trim the sashing to the exact measurements of the blocks/squares. 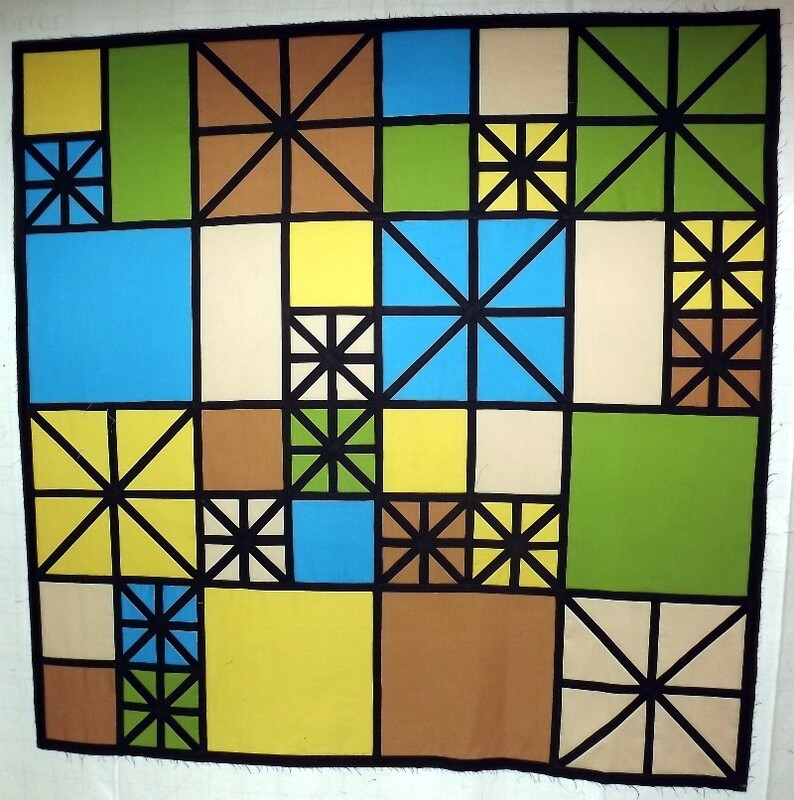 Match each of those blocks with its partner, sew and press to the sashing. In the next step it’s important that the sashing go on the correct side of these units. It is easier to sew the plain sashing strips with the seam allowances of the blocks on top and the strip on the bottom, to help you keep the seam allowances from folding over. Go through your coloring sheet again and chain piece the left half of the units you just created onto sashing strips. Leave just a little bit of space between the units, and don’t forget to check that you have enough room on the strip to get the entire unit on it! Press to the sashing then trim the sashing to the size of the unit. Finally, sew the other half to the strips. If you’re making the larger quilt, this is a bit easier because the strips are wide enough not to interfere with the foot. Place the first unit in each pair with the sashing at the right, then place the second unit in that pair to the right of the sashing. Turn the right unit over onto the sashing, line up the center cross strips, if there are two, pinning as necessary, and sew. If you’re making the small quilt, there’s a little bit of a flip and twist in this last step. Place the first unit in each pair with the sashing at the right, then place the second unit in that pair to the right of the sashing. Turn the right unit over onto the sashing, then flip it over so you can put it through your machine with the sashing on the bottom. 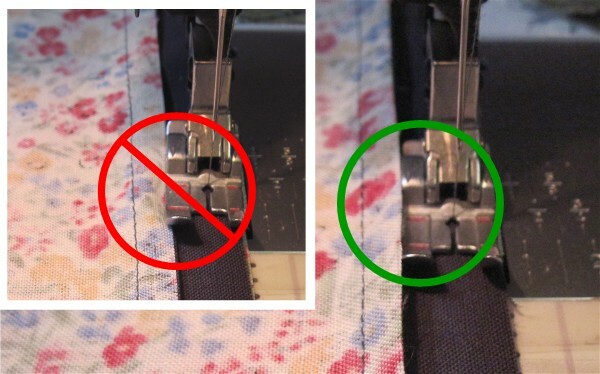 This is important because the narrow sashing strips cause the seam allowance to run very close to the presser foot, and may be pushed out of alignment if you don’t lift it away as you did during block assembly. 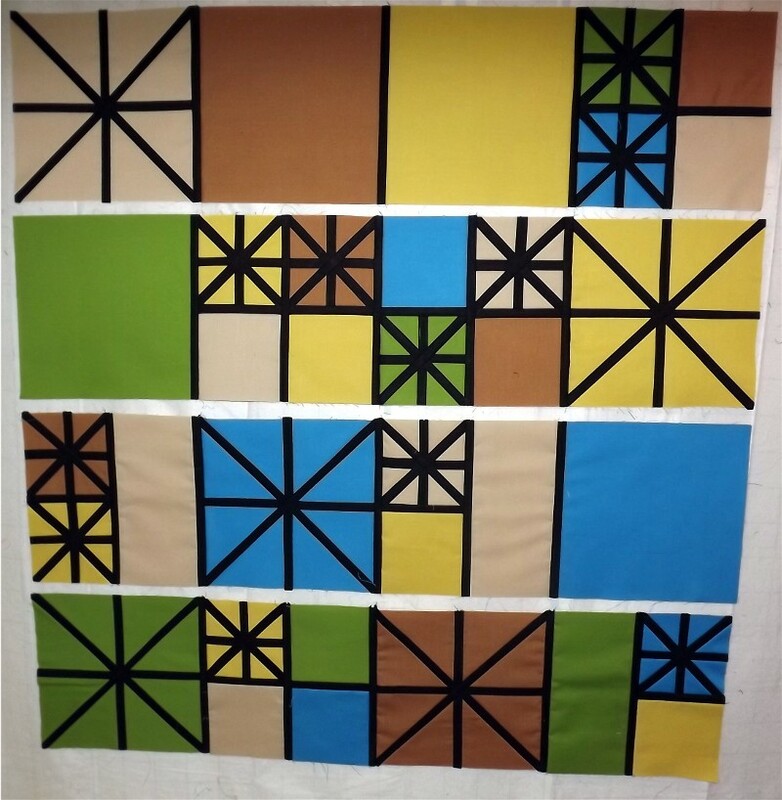 Once your blocks are all sewn together and the sashing is trimmed, lay them out on your design wall, floor, bed, etc. Check your placement against your coloring sheet. You’re almost finished! All that’s left is joining the blocks together with sashing strips. Chain piece the blocks onto the sashing strips, leaving a small space between them as always. I sewed the sashing strips to the right side of the first three blocks in each row, but that meant flipping the blocks upside down to make sure the placement was correct. It may be easier for you to sew sashing strips to the LEFT side of the LAST three blocks of each row so you don’t have to turn them upside down. Trim the sashing so it’s even with the edge of the blocks. Join the blocks together to form rows. If you’re making the larger version, you can put the sashing on the bottom so you can see the seam intersections as you sew over them. If you’re making the smaller version, put it through your machine with the sashing on the bottom so you can lift the seam allowance away as you did during block assembly (see photo above). Sew long sashing strips to the top side of each row, plus the bottom side of the last row. For the larger quilt you will have to join sashing strips to make them long enough. Trim the sashing, then join the rows. Same as before, with the smaller quilt you need to put the sashing on the top when you join the rows and lift the seam allowance out of the way. Finally, sew a long sashing strip on the left and right sides of the top, forming a narrow border. That’s it! Your top is finished! Thanks for the update, Sandi. I’m hoping to get my top finished soon!